GET READY… Here is comes again! 18 ways to get through Mother’s Day! Here it comes again, it washes over me and I am knocked down by the impact of the day and the feelings I have — Mother’s Day. That day where mother-daughter groups I see are smiling and relishing the day. I struggle with the masks that I wear on Mother’s Day. One is the mother who relishes the daughter I have and am thankful that the feeling is mutual. That is a treasure that I would not change. The other is the young girl who lost her mother at 15 and never had a mother’s nurturing love after that. That girl yearns for a mother’s unconditional love. I also see women who have not had the nurturing of their mother because of emotional absence. That is hard too. One woman whose mother was living, said, “How can I look at my mother and celebrate Mother’s Day when she was never a mother to me? I have learned to celebrate women who have helped me find my way, those who have lit my path. “ For this woman, it was her grandmother. For others, it may have been a teacher, a sister, a favorite aunt, or a neighbor. So I am preparing myself. You need to get yourself ready too. We all need to put our grief somewhere. I have put together a list of ideas that have been given to me by many women to help them cope with the day. Write your mother (or the woman who has lit your path) a letter and tell her all the ways you miss her. Read your letter to someone who you trust. Just the act of reading it aloud is empowering (not to downplay how difficult that is to do). Celebrate the things that you appreciate the most. Have a special meal in her honor. If she is deceased, set an empty chair to signify her presence. Tell some of your most favorite stories about her that you remember. Write about her, share her legacy with your loved ones. Record stories about her. Your memories. Organize a balloon lift in her honor. Prepare your favorite food she made for you. Plant a garden in her honor. Give yourself grace and space to just be present with your emotions you are feeling. You will be OK. Remember if you have children, it is OK to let them see you cry. You are modeling to him or her that yes it does hurt when we lose someone who is dear to us. It is real. You are real. Your grief is real. You are not alone on Mother’s Day. If you are reading this, you are part of a HUGE community of women who understand. Share what you do to get through the day. Let’s reach out and help each other. Wonderful article & very nicely explained! If you don’t mind, I’m going to share this with a brunch I’m having Saturday to honor those who are grieving their mother’s. I needed to read this. THis will be my third year without my mother and every year is hard.I dread it. I will go to the cemetery and put out new flowers. I miss her deeply. I was 58 when she passed away. A long time to have a mother. I find now so many memories are coming to me when I was a child. Strange but real.My siblings and I are not close so that makes it harder . No one to share . I will make it and be relieved when it is over. Yes Marilyn, we always make it through some way. It is not easy. Know you are not alone. There is a whole community of women to share your pain with. Regardless of the age of loss, it doesn’t make it easy to lose a mother. You just have more memories than those whose loss was earlier. Where do you put those memories when they come to you? Is there a place where you can write those down? Just the act of writing them down is a way of grieving. And that is what you are doing, grieving. Be kind to yourself. Allow yourself to grieve. 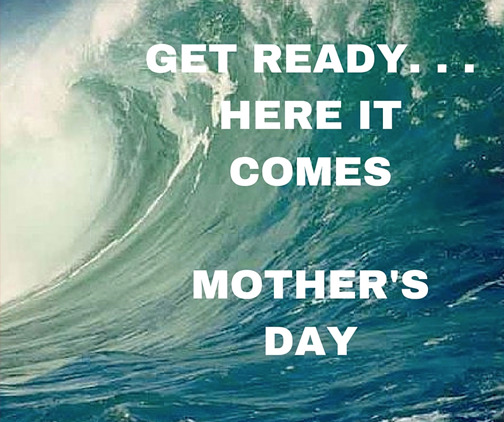 Don’t let the grief build up so it is only released on Mother’s Day. Make it active and work on it. You will get through this. This is my first Mother’s Day, without my mom….. I am so sorry for your loss, Angela. The first year is tough, but it doesn’t get any easier as the years go on. It just becomes different for different reasons. This year, cry, cry, cry. It is OK to just be in your sorrow. Know that there is a community of women who do understand. I will hold you in my thoughts and prayers on Mother’s Day. I pray that your memories comfort you .